Whoa, Nana! No need to go over the river and through the woods to enjoy this educational app for the youngest of the iPad users in your family. The younger crowd will be able to easily play, but grandkids of all ages will enjoy. – None! Who doesn’t love a trip to Gramma’s house? 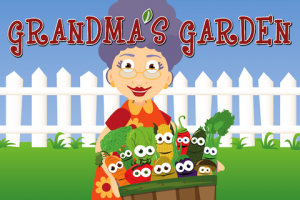 In Grandma’s Garden, forget the overwhelming odors of Ben-Gay and mothballs and prepare yourself for this veggie-loving Gramma to help your kids learn letters, numbers, and more! 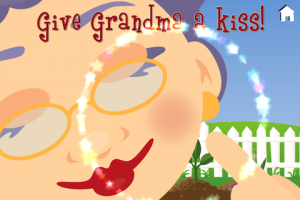 Grandma’s Garden is sure to make you and your kiddos giggle with excitement. Simple and bright graphics, easy verbal instructions, and an enthusiastic guide with a green thumb make this game appeal to all ages. 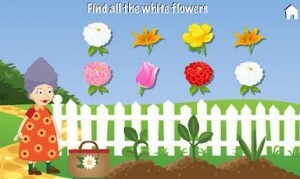 Six different mini-games make up this app and cover a range of skill building. Each game targets more than one skill at a time; Match The Vegetables helps with vocabulary and memorization, First Letters focuses on the alphabet and vocab, and Shapes helps with (wait for it) shape recognition by having the player choose a watering can with the appropriate shape. There’s also Color The Vegetable, Count The Vegetable, and Touch the colors. Grandma stood to the left of her garden and talked me through each mini-game and followed a correct answer with encouraging phrases such as “Oh this is fun, isn’t it?” and “Let’s try some more!” I even made “Grandma want to dance” – after which she performed a little jig. After a round of a few different mini-games I had the chance to pick from Grandma’s Mary Poppins-esque bag and I happened to pull a stinky sock, a purple flower, and approximately 34 cents. Perhaps the most delightful part of this app is when I was presented with a close-up of Grandma’s cheek and she asked me to kiss it. I did and caught myself giggling while my children gave me a very odd look. Once they saw me kiss the iPad I couldn’t keep the kids from grabbing for the iPad and they both could easily play the games together. 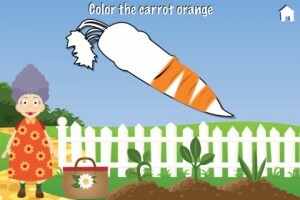 This is the most fun we’ve all had playing an app, and the most universal educational app that I’ve played in a while. The download price of $0.99 is well worth it, and you won’t even have to walk around with fuschia lipstick smeared all over your cheek.